Photo By Paul Purpura : ©2009 www.nelsoncountylife.com : Wintergreen and area rescue members on a training exercise earlier this year along the BRP. A big congrats to members of Wintergreen Rescue after competing in the state rescue convention held last weekend at Virginia Beach. Wintergreen Fire & Rescue Chief, Curtis Sheets, tells us they entered four different contests. 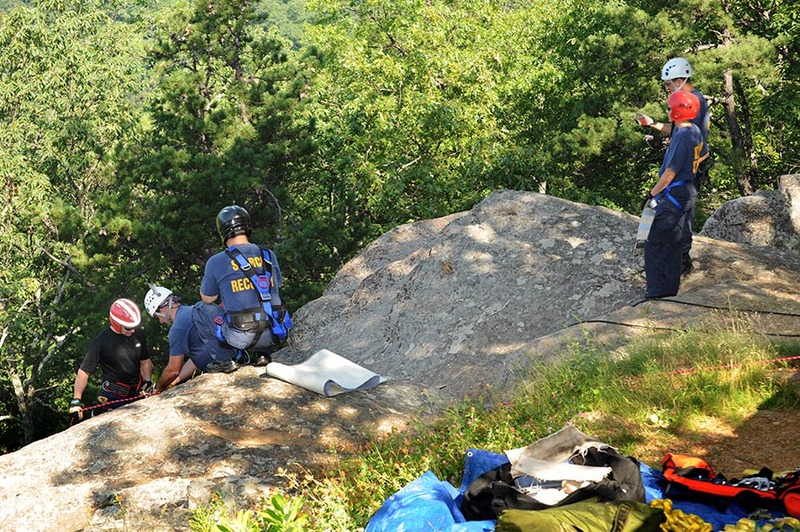 In the rescue team category: “Essentially, this could be called “rope rescue.” The mock scenario included two patients working beneath a bridge when they fell and were dangling from their harness 60′ above a ravine. Our team of 6 had to safely package them and get them to the ground in less than one hour. Our team placed fourth. Just completing the problem their first time competing is a huge deal. I’m very proud of our team and the countless hours they put into practicing. I also very much appreciate the efforts of Robin Root, our in-house rope instructor who has served as their coach. Our website shows the full list of team members. Those who competed were Jared McNeal, Jeremiah Fish, Deryk Botkin, Jeremy McNeal, Robbie Hubbard, and Mike Riddle. It is also worth mentioning that we have partnered with Montebello Rescue Squad on this effort and they have members actively practicing with our team.,” Chief Sheets says. On the Advanced Life Support Call of the Year, Wintergreen was named the best. “I’m happy to say that we were awarded first-place in this category. The award submission is quite amazing,” Chief Sheets continues. The call involved a young UVA student who rode his bicycle into the path of an oncoming car on the Blue Ridge Parkway. Every aspect of the call, including response times, quality of care, and more are considered by the judging panel. Chief Sheets went on to say that staff member, and EVOC Instructor Mike Riddle competed against over 30 competitors. This contest involves a written test as well as a vehicle operations course. Mike placed 11th. Chief Sheets praised Mike Riddle who has been improving the squad’s website over the past year. (http://www.wtgfireresq.org/) And he recognized volunteer Amy Markham. “Amy has been with us for just a few years. She serves as the highest ranking officer for our district within the Virginia Association of Volunteer Rescue Squads. Amy was recognized as being “Vice President of the Year” and was also recognized for submitting the best reports for the year’s worth of activities for District 1. There are 10 District Vice Presidents,” Chief Sheets added. Congrats again to Wintergreen Rescue and all of the squads! Wintergreen, VA Weather : Monday : Sunny & Fair : Rain By Tuesday PM : Congrats to NCHS Govs State Winners! Very nice indeed! Double high fives all around. I am always proud of this dedicated, hardworking group of professionals and am so thankful to live in Nelson County, where there are also many dedicated volunteers.